15 young students from 7 countries - Mexico, Hungary, Bulgaria, Spain, South Korea, Ukraine and Latvia, participated in the summer school. From 24 July to 4 August, students, together with experienced mentors, architect and stage designer Didzis Jaunzems, landscape architect and urbanist Aigars Lauzis, stage designer and carpenter Rūdolfs Bekičs, developed ideas for the Valmiera Summer Theatre Festival (VVTF) city in Hanzas Square, right in the centre of Valmiera. 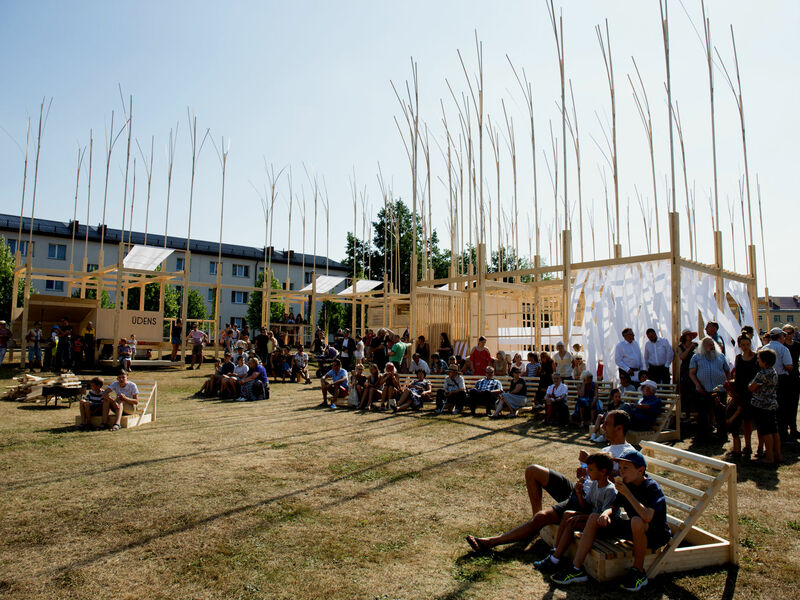 After the fixation of the architectural and constructive solution in the first week, the participants of the summer school, jointly with professors and the technical team of the Theatre Festival, created the city of the Festival in the empty square in five days - a magical forest with the stage of the honorary circle of Latvia and campsite, the information centre, Valmiermuiža cafe, children’s amusement park, outdoor cinema, pizzerias and a water collection point. Concurrently with the ongoing work with the planning and construction of the city of the Festival, future architects also participated in inspirational lectures and engaging discussions with professionals of the industry: The creative director of VVTF Reinis Suhanovs, architect, Dean of the RISEBA University Faculty of Architecture and Design Jānis Dripe, architects from Belgium Małgorzata Maria Olchowska, York Bing Oh, Estonian architect Ralf Lõoke, and the artist Andris Eglītis. The participants mastered the history, creation, and development of the city of Valmiera, visited the Valmiermuiža Brewery and tasted Latvian flavours during a special dinner, went on tours to the Lake Castle of Āraiši and Cēsis, visited cultural and entertainment events during the Valmiera City Festival, and theatre performances and movies during VVTF. “This experience is something new for me - I have never participated in such workshops. It is very interesting to feel the difference of various cultures, we talk in order to teach other a lot. Our thoughts on architecture and construction also differ; we all have our own view,” says participant of the summer school from Ukraine - Ksenija. The city of the festival was officially opened on 3 August, and from the afternoon of Friday until the late night of Sunday it was inhabited by visitors of the theatre festival and citizens of Valmiera. Participants were surprised by the wooden construction grid that was placed on a regular net plan configuration, above which designed trees were raised, that with the help of light and movement effects created the magical illusion of a forest. "We have to be able to compete with the environment that is around here; we have St. Simon's Church, we have Valmiera Theatre, we have a supermarket; we cannot be small! As the saying goes “to make a difference” - we have to leave an impression”, added the project manager of the summer school, architect Dina Suhanova. Without a doubt it was a success, because while the Festival activity was present in the square, visitors came and gladly enjoyed relaxing in the city that was specially built for these three days. Many thanks to ALL participants, professors, organisers, supporters and others involved who helped to implement the project for their support, cooperation and energy! A special THANK YOU goes to the author of the idea - the Director of the Bachelor’s programme “Architecture” - Dina Suhanova! The Summer school was organised by RISEBA University Faculty of Architecture and design in cooperation with VVTF. Latvia state scholarships were provided to foreign participants by the State Education Development Agency. Financial support was provided by RISEBA University and the local government of Valmiera City. Cooperation partners - Valmiermuiža beer brewery, Valmiera drama theatre, cafeteria “Tērbata”, cafeteria “Bastions”, “Valmiera Vocational Training Centre” and others. The centre of the Festival was organised in cooperation with “Latvijas Goda aplis”, “Byko-Lat”, “Latvijas Finieris”, “Delve2”, “Ramirent” and others.